The Sig Sauer SP2022 (with the “SP” designation meaning “Sig Pro”) was released to the US market in 2003, but was actually built as a military sidearm for the French military in 2002. France was migrating from an older handgun (a licensed copy of the Beretta 92FS), and wanted a lighter, more modern solution from Sig. Various sources have reported that the 2022 designation originated from the fact that the pistol was introduced in 2002 with a planned 20 year lifespan, so the 2022 number comes from the estimated year of its end of life (2022). The 2022 is basically a modified version of the Sig P2009 (introduced in 2009) and Sig 2340 (introduced in 1998) direct descendant of the Sig Pro model that was introduced by Sig Sauer in 1988. 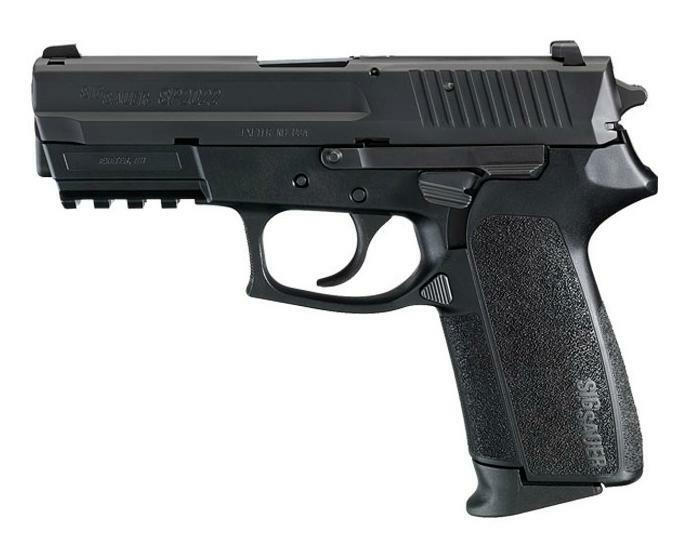 The Sig Pro series was Sig’s first foray in using polymer as a frame material. In many aspects, the original Sig Pro model that was released in 1988 was well ahead of its time as it featured a replaceable backstrap that would allow a shooter to change the thickness of the grip, and featured a proprietary Sig rail that was integrated into the frame. When Sig introduced the SP2022 to the US market in 2003, the integrated rail was migrated over to a standard 1913 Picatinny model, and the pistol was outfitted with a new decocker that was easier to use. Sig believed that the 2022 would be a candidate for military and law enforcement adoption, so the first US based SP2022 models were chambered in 9mm and .40 caliber. The 9mm version was introduced in 2004. The SP2022 can also be fitted with a threaded barrel for use with a suppressor. Right or wrong, the lower price point of the SP2022, led to it developing a reputation becoming known as “poor man’s P226” as the P226 was more costly, and long considered Sig’s flagship pistol. Although the SP2022 utilized a number of more advanced features, it never really caught on in the law enforcement market. #1 – I’ve heard that the SP2022 is basically the same size as the Sig P229. If that’s the case, will a SP2022 fit in a P229 holster? Unfortunately, that isn’t really accurate. Although the 2022 and the 229 are similar in size, they have different dimensions. An SP2022 won’t fit in a holster made for a P229 very well. #2 – Do you offer any holsters to fit a SP2022 with a Streamlight TLR-2 attached? Any MTR Custom holster listed below is available in a version to fit the SP2022 with a number of possible lights or lasers attached, including the TLR-2. #3 – Will an SP2022 fit in a holster made for a Sig SP2340? Although both pistols are similarly sized and certainly favor one another, the answer is no. This is due to a difference in the rail platforms. The 2340 is equipped with a smaller Sig rail, while the 2022 has the larger 1913 rail system. #4 – I don’t have an SP2022, but I do have a Sig SP2340. Do you offer any holsters to fit it? Yes. Holsters for the Sig SP2340 can be seen on this page. #5 – I have a Sig SP2022 and want an outside the waistband models with a retention strap. Do you carry anything like that? Yes, there are a number of holsters listed below that would work, including any MTR holster as they can all be built with an optional thumb break. #6 – Do you offer any magazine carriers for the SP2022? Yes, and those can all be seen here. Any of the holsters listed below are available in version to fit the Sig SP2022.